Steroids can have numerous negative health effects, many of which can follow teens into adulthood. For example, steroids cause shrunken testicles, breast growth, high blood pressure, liver problems, and injured tendons. Testing student-athletes for steroids is an excellent way to spare teens from these unfortunate side effects. While steroid testing can deflect any steroid use among high school teens, the testing is also a great way to inspire teens to avoid drugs. When students know that they will have to pass a steroid test to play on the team, they have more motivation to stay clean. The process and consequence of a positive test cost more than the thrill of doing something they’re not supposed to. It ensures that steroids hurt, rather than help, the teens’ performance. Standard athletic testing is a great way to keep teens from taking hazardous, performance-enhancing steroids. Does testing student-athletes for drugs infringe on privacy rights? Not if it is done correctly. Steroid testing should be done randomly, fairly, and without discrimination. This way, the steroid tests are more likely to help keep the students safe without infringing upon their rights. Steroid tests should be there for prevention, not punishment. These days, more teens than ever report knowing how to obtain steroids, and many of them don’t feel like steroids are that much of a risk. 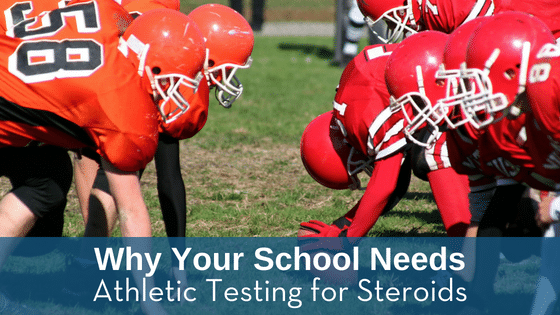 Schools need to consider looking into athletic testing for the safety of their students.